Say you’re part of an industrial company with large and immobile equipment. The immobile equipment is vital to your business and has to meet stringent requirements in a highly regulated industry. In order to meet these stringent bio-security requirements, you need to perform complex service, maintenance and repair, all while keeping costs as low as possible. AgCo is one such company. It produces and protects part of the world’s food supply, and training new workers to perform complex maintenance on large and immobile machinemury is vital to keeping their portion of global food production in high order. In a recent webinar hosted by PTC, Lance Brown, Global Learning and Business Development Director of AgCo, spoke about how the company has been leveraging PTC Vuforia to create augmented reality experiences for sales, marketing, training, installation, service and maintenance. AgCo designs and manufactures large and immobile equipment, including products such as a large grain facility with steel silos that hold 1 million bushels of grain which protects them post-harvest. The system also includes giant boons that dry the grain prior to their storage. Virtual product demonstrations are necessary to save money on transportation costs when your equipment is massive and immobile. AgCo used to ship parts of their equipment around the country for tradeshows, which was expensive and yielded confusing demonstrations for attendees and potential customers. In contrast, AgCo now has a digital version of their entire fertilizer blend tower that can be shown to attendees in augmented reality. Attendees can interact with the 75-foot tall digital tower, moving up and down to different platforms on the virtual tower by using simple voice commands. Previously, communicating features of this fertilizer system could only be done by showing potential customers just a portion of the system, leaving people with a muddled impression. Showing products at scale during trade shows, collaborating among sales teams performing engineering quoting, showing retailers and dealers their custom-built products at scale helps them understand how they can sell AgCo equipment to farms much faster. Transportation costs ran high at AgCo, especially sending equipment to different locations for in-person field training. Using augmented reality allows AgCo to avoid purchasing expensive equipment for training, improve the quality and increase the efficiency of training. They began building AR experiences using PTC’s Vuforia Studio with existing CAD models in order to better help their dealer network and construction crews understand and service their products. For grain dryer training, which starts in November, AgCo used a slide deck with over 200 slides and to transfer twelve different training modules. After transferring the modules into AR, they are expecting to be able to communicate the 12 different learning experiences in 48 hours instead of five days. Field technicians and AgCo’s dealer team run into a common problem from customers: trying to identify a part of a piece of equipment by its part number. Internal adoption of augmented reality in the case of AgCo is helping them lower costs with new training methods, improved marketing and higher operational efficiency. But they are also using AR for strategic differentiation, building experiences designed to improve the services and products they offer customers. Customers of industrial enterprises want value-add services that reduce downtime, and companies providing AR experiences to help process customer service requests are taking advantage. Though implementing AR is a tricky task, companies generally begin with pilot programs based on internal proof-of-concepts that demonstrate how AR will improve processes internally. 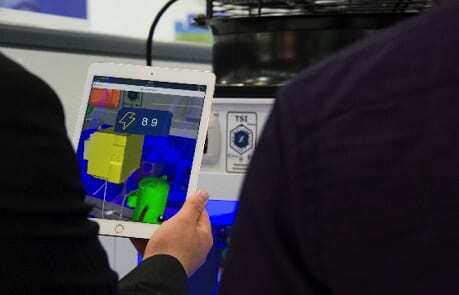 Then, they can expand their AR programs by showing how AR products, services and solutions will help customers visualize data to help them solve problems and satisfy requests in the same successful they’ve improved internal processes with AR. For industrial enterprises that adopt AR experiences to improve internal training and serviceability like AgCo, adapting these services to offer them to their customers will increase the value their customers get from a given company’s products. Trox do Brazil manufactures central air conditioning components and is developing augmented reality experiences to make life easier for their customers. If you’re into cycling, you at least know of Cannondale and their quality biking equipment. 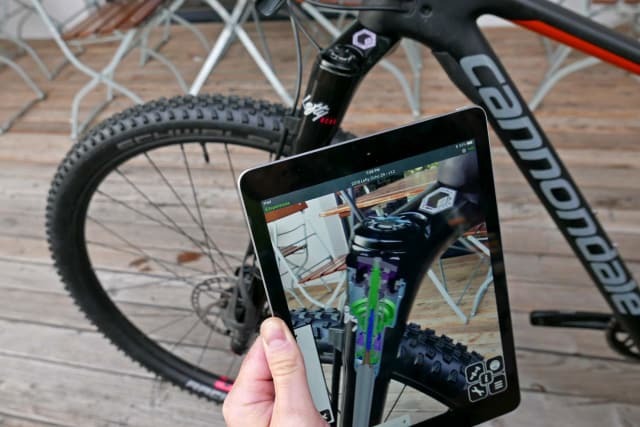 They sell a bike known as Lefty Ocho, and it comes with AR experiences that guide a customer through assembly and operational maintenance and repair. Determining a viable ROI for implementing an Augmented Reality pilot program is a multivariate problem for industrial enterprise companies. 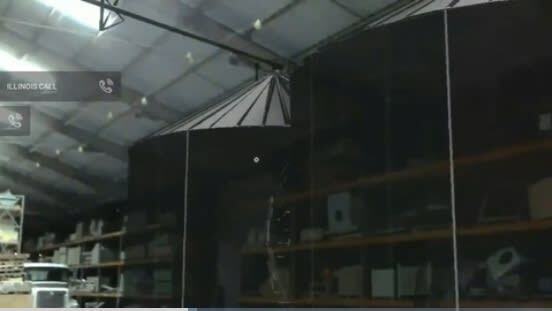 Depending on a given company’s products and services, a solution involving PTC’s Vuforia Studio and Microsoft HoloLens might be a viable option. Or they might benefit from a mobile solution using Vuforia Studio. One group in California called the AREA (Augmented Reality for Enterprise Association) is trying to determine how exactly AR enthusiasts at industrial enterprise companies can implement pilot programs with realistic expectations detailed in accurate ROIs. In this report from 2017, a fictional ROI from implementing an augmented reality solution to improve product design provides an example of how to use financial metric data to create a worthwhile analysis. (Image courtesy of the AREA). 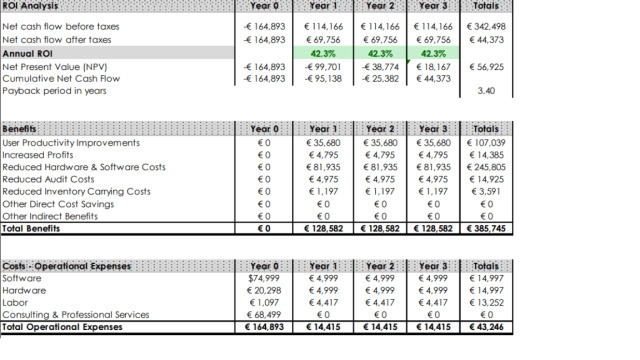 The metrics by which this ROI analysis measures the efficiency of the AR implementation are clear. Calculating net cash flows generated by the investment in AR against its cash outflows (cost) is trickier than the average investment in IT infrastructure and software. A lot of the value derives from viewing CAD designs at a 1:1 scale in augmented reality, which can help bridge the gap between imagining what a 3D model on a 2D display screen would look like at a 1:1 scale in physical reality. There are quite a few AR, VR and MR headsets on the market, and they each have accompanying software. Sometimes the software is written by the headset manufacturer, and sometimes it is written by outside developers. Knowing this, the investigation for uninitiated product design teams begins with a few basic questions. What configurations of headsets and software are other product design teams currently using with success? In what areas, fields and disciplines? Are there any configurations of headsets and software that are demonstrably better than others? Is there enough data available for a product design team to choose one configuration of headset and software over another? As companies like PTC continue to empower their industrial enterprise customers to create a variety of augmented reality experiences on HoloLens and mobile devices, the holy grail of a universal ROI for implementing AR is slowly becoming a reality. If you're interested in augmented reality or knee deep in producing your own augmented reality experiences, join ProjectBoard if you haven't already and check out great AR projects like this one.